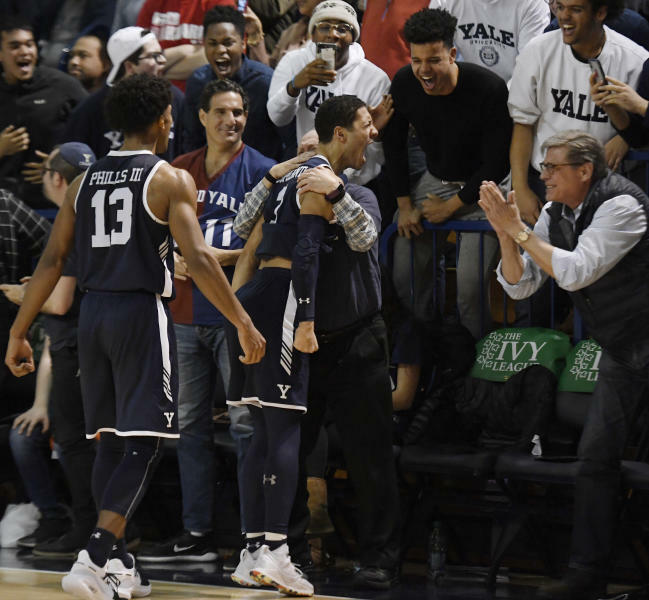 NEW HAVEN, Conn. (AP) — Two thoughts kept running through Alex Copeland's mind as his Yale team prepared to take on Harvard for the Ivy League championship and an NCAA berth. First, he couldn't stop thinking about how hard he would cry if the Bulldogs lost on their home floor to their archrival in front of friends and family. Second, he couldn't stop thinking about how hard he would cry if they won. The tears turned out to be happy ones. 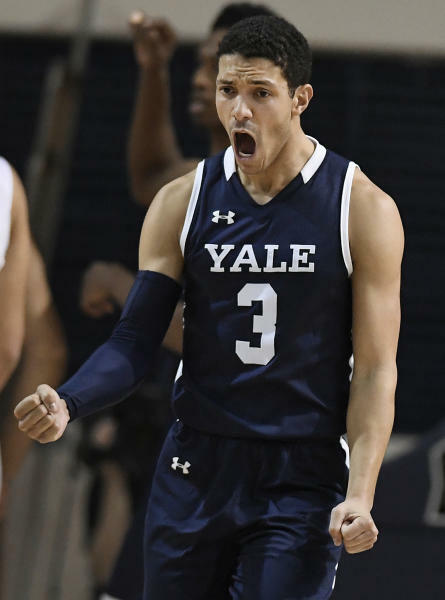 Copeland scored a season-high 25 points and Yale beat the Crimson 97-85 on Sunday for its second NCAA Tournament trip in four seasons. Yale (22-7), which lost to Harvard (18-11) twice in the regular season, used a 15-0 burst in the second half to take control. The Bulldogs celebrated with their fans who poured onto the floor when it was over. "Visualizing those moments ... it's been going on for so, so long that to actually be here and to be talking about it sitting next to these guys feels so surreal and it just feels amazing," Copeland said. The Bulldogs will return to the NCAA Tournament for the first time since a memorable run that saw them beat Baylor in 2016. After that opening win, Yale then played Duke tough in a 71-64 loss. "It was nice to go as freshmen, but at the end of the day we realized we were just minor pieces in that," senior Trey Phills said. "We really wanted to carry and lead a team, give these other guys the experience we had." Bryce Aiken scored 38 points for Harvard and Noah Kirkwood added 19. Copeland was chosen the Ivy tournament's most outstanding player. The senior guard, who had seven assists, scored eight points during Yale's big run that turned a 59-58 deficit into a 73-59 lead. "He's had a tremendous career and he stepped up big time for us tonight," Yale coach James Jones said. Miye Oni, the Ivy League's player of the year, spent most of the game in foul trouble, but added 17 points for Yale. Azar Swain had 15. Yale hit four of its first six shots and jumped out to an 8-2 lead on a spinning layup by Jordan Brunner. The Bulldogs stretched that to double-digits when Brunner found Blake Reynolds (14 points) underneath for a layup that made it 29-19. But Aiken kept Harvard in the game. He hit six of his 10 shots in the first half and his three free throws gave the Crimson their first lead at 38-37. Yale, which shot 61 percent over the first 20 minutes, led 43-42 at halftime. Harvard came out strong after intermission and led 52-45 after a dunk by Kirkwood. "It's a game of runs and we weren't able theirs going down the stretch and ultimately that led them to get the victory," Aiken said. Yale scored the next eight points, capped by a jumper from Oni, who picked up his fourth foul with more than 14 minutes left and played just 10 minutes after intermission. "I looked at the clock and I looked at the rest of the guys on the court and I said, 'We've got to do it without him. We've got to hold it down until he can get back in the game,'" Copeland said. The Bulldogs kept the Crimson at bay after their big run and cut down the nets on their home court after winning basketball's version of The Game. Yale hit 28 of its 30 foul shots in the game (93.3 percent) and Oni was 10 of 10 from the line. Harvard made 19 of 24 free throws. The win gives Jones 310 at Yale, tying him with Fran Dunphy (Penn) for second all-time in the Ivy League. He would need another 204 to catch former Princeton great Pete Carril. Yale: The Bulldogs and Crimson were both 10-4 during the regular season, but the Bulldogs were playing as visitors on their home floor because of their two losses to Harvard during the regular season. .
Harvard: Harvard came into the game 7-0 versus Ivy League Tournament teams this season, including that 2-0 record against Yale, the tiebreaker which earned the Crimson the top seed in the tournament. It also guarantees them a spot in the NIT. "I mentioned that to our kids," Harvard coach Tommy Amaker said. "There's still basketball for our program to participate in a national tournament. We're proud of that." 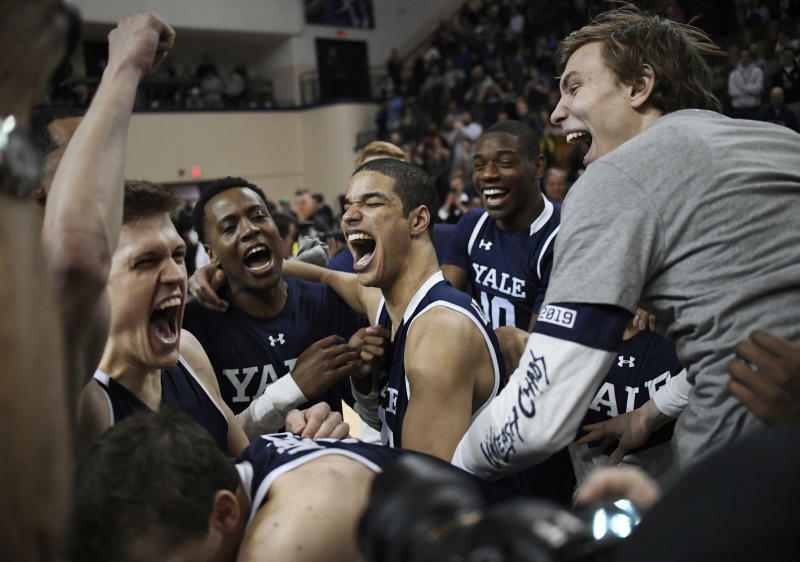 Yale: The Bulldogs, a No. 14 seed in the East Regional, will play No. 3 seed LSU on Thursday in Jacksonville, Florida. Harvard: The Crimson will visit Georgetown in the NIT on Wednesday.